Digitalization and the rapid development of new technologies is fundamentally transforming the marine industry. New innovations increase efficiency and flexibility. However, these innovations are no longer confined to products and systems. They will also revolutionize marine maintenance services. Wärtsilä Seals & Bearings is introducing augmented reality and smart glasses in stern tube seals & bearings services, creating a whole new dimension in repair and maintenance operations. The augmented reality technology does not only have one specific application. It can be used for a multitude of different tasks. With the help of augmented reality, a field service engineer, a member of a ship’s crew or shipyard personnel will have immediate access to the global expertise of Wärtsilä Seals & Bearings – regardless of where and when help is needed. The use of augmented reality technology simplifies troubleshooting and speeds up the service and repair of stern tube equipment. It also makes tasks like inspections, alignment measurements, on-site machining, shaft straightening and newbuilding commissioning much simpler – and faster – than before. The time and cost-saving possibilities are enormous. “Augmented reality can be used to solve complex problems that would otherwise require considerable time to resolve. Smart glasses – equipped with WiFi, Bluetooth, camera and microphone – enable real-time communication with a remotely located Wärtsilä expert who can see and hear exactly what happens on board, in dry dock or in a workshop, no matter how far the customer’s installation is,” says Thomas Pauly, Product Manager, Seals & Bearings Future Technologies. The person on site can send and receive visual images, listen to the specialist’s advice, and receive written instructions right in front of his eyes on see-through-displays. The expert in Wärtsilä’s Expertise Center can guide the person on site through the actions he needs to perform to solve the problem. “The expert, located far, far away from the vessel can demonstrate how to make the repairs using images, manuals and even video footage. All while the engineer on site can continue to work. It’s like having a Wärtsilä service engineer by your side 24/7, with the bonus that this “virtual” service engineer has real-time access to the vast wealth of information and expertise that Wärtsilä has accumulated over the years,” Pauly continues. Wärtsilä believes that by embracing new ways of thinking, developing and collaborating, significant value can be created. 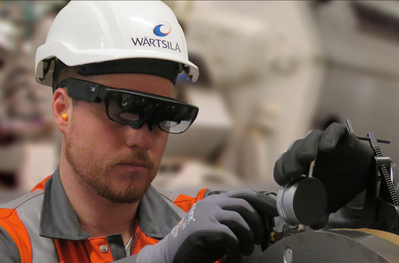 Currently, Wärtsilä is carrying out pilots with selected customers to establish smart procedures for using augmented reality in a broad range of Seals & Bearings tasks. We’re able to use the technology for example when working on installations in remote parts of the world where access is restricted, or onboard ships when there is no GSM signal. With the smart glasses, the person on site can take videos and pictures of a situation and save them on the glasses’ internal memory. These files can then be sent to Wärtsilä’s Expertise Center, e.g. via a satellite connection or via a GSM when there is signal again. “Augmented reality enabled repair and maintenance services deliver significant added value in terms of quality, lower costs, and increased uptime. They will take the seals and bearings related repair and maintenance services to the next level,” Pauly concludes.